Microsoft used a cracked version of Sound Forge to create files that are inside the Windows Tour folder.The wave files have been made with Sound Forge 4.5 (The cracked version) first cracked by a cracker called “Deepz0ne” . Deepz0ne was one of the founders of the cracking group “Radium” and cracked the first ever Sound Forge 4.5, for illegal, pirate use.It seems that Microsoft have got the pirate copy, and just made the files on that. You don’t believe Microsoft Is A Liar ? Then check the following in your Windows Xp . 1. Open C:\Windows\Help\Tours\WindowsMediaPlayer\Audio\WAV. Here you will find many audio files of .wav format. 2. Open any one of these wav files in Notepad or Wordpad. 3. In notepad you will find text in unknown format. 4. Scroll to the bottom and you will see this text 2000-04-06 IENG Deepz0ne ISFT Sound Forge 4.5. 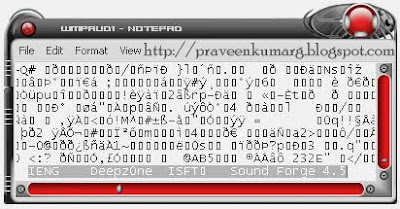 This text 2000-04-06 IENG Deepz0ne ISFT Sound Forge 4.5 is added for those Sound Forge 4.5 which are cracked by Deepz0ne. 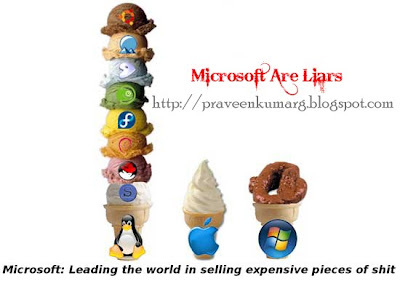 Now you can very well realize that Microsoft are liars, and also fakes. We know Microsoft continues fight against piracy.As part of its Genuine Software Initiative, Microsoft has filed lawsuits against 20 resellers that have been distributing illegal copies of the company’s software. If such a billion dollar company is not ready to pay for a small software(Sound Forge), why do they expect people to buy their softwares?